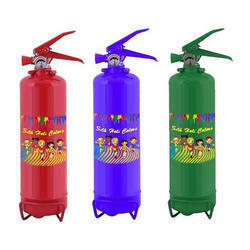 Manufacturer of a wide range of products which include silk color blasters. Color Red, Blue, Green etc. Gone are the days of Pichkaaries, now immerse your friends in dry color powder, without spoiling their clothes, use Silk Color Blasters and celebrate stain free Holi. Offered Silk Color Blasters are widely demanded in textile and many other industries to make different products colorful. Eco friendly in nature, this color is safe to use. Durable body is given to this blaster. Reliable in nature, this blaster is light in weight and leak proof in working. Moreover to this, these blasters are appreciable in working and made with durable frame.